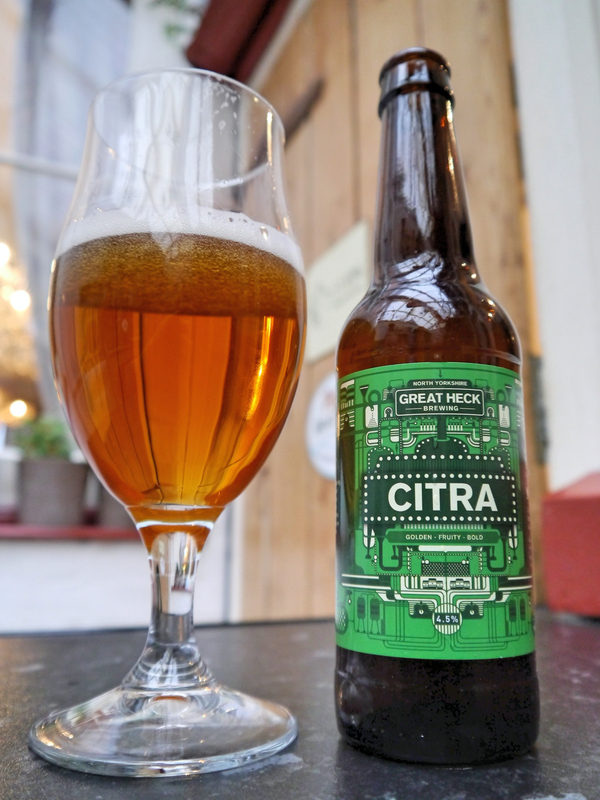 Citra. Just what is it, why are so many of us infatuated with it? What makes this hop so special and constantly drooled over? Are you guilty of hunting down a beer that has the magic word on its label just to taste, well, just to taste what exactly? The Citra hop, aka HBC 394, has been developed by the Hop Breeding Company and promises to impart ‘interesting citrus and tropical fruit characters to beer’. The hops parentage lay in Hallertau Mittelfrüh, US Tettnang, Brewer’s Gold and East Kent Golding. That may go some way in explaining the varieties of flavours you can expect to receive from the hop, but just what are those flavours? Now the tropical fruits I get, but what is interesting citrus? I suppose if you crossed a lemon with something like a banana, that could be quite interesting, or could it? Either way, there is no escaping just how popular the Citra hop is and pretty much every brewery has a beer that includes it. Whether it be a traditional multiple hop beer, or just a single hop variety, there is no shortage of beers available to satisfy your Citra cravings. For now, I’m focusing on single hop beers and I have gathered together a small collection, of varying styles, that will hopefully show just exactly what it is Citra can offer when used on it’s own. So, it’s over to the breweries. This was first brewed back in 2009 after John Bryan, the production director and former head brewer at Oakham Ales, made his annual trip to the hop fields of North West America where he discovered the Citra hop. 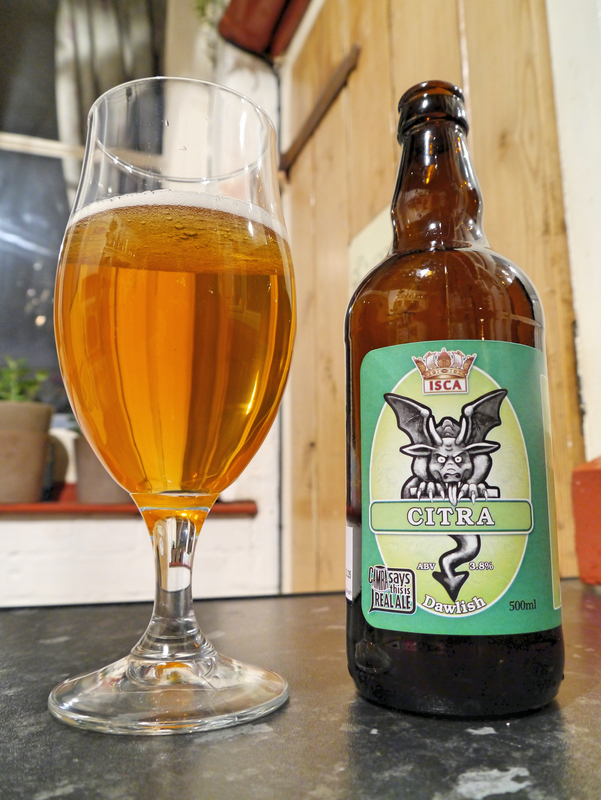 At the time Citra had never been used in the UK and only a small number of US brewers had brewed with it. Immediately after making the discovery John arranged for a quantity of the hop to be sent back to the UK to start brewing. Unable to contain his excitement, he organised for the hop to be flown home as the boat journey would have taken too long! 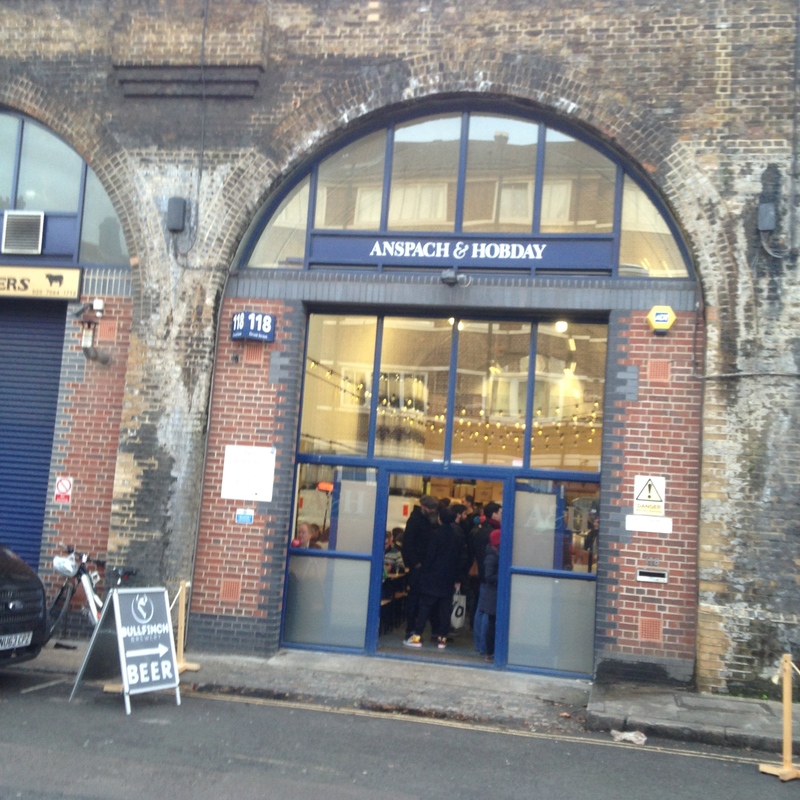 Such was the reception and good feedback that the beer received, it was added to their permanent range in 2010. And now, after winning many awards, this beer has definitely brought our attention to Citra, or is it the other way around? Either way, it has set the benchmark for all other single hop Citra beers. Tasting this beer is quite special, and if you have never sampled Citra before, then it will open your eyes. The aroma is prominent and formed of a good load of passion fruit and mango with a nice hint of citrus. It’s like chucking your nose in a fruit bowl and bringing out a beer. To taste there’s no hint of malt and the fruits carry on nicely with that citrus edge. The finish is dry and bitter, and then the malts show their face, leaving behind a slight breadiness all ready for the next expectant mouthful. At 4.6%, you can have a great session with this and the bitterness is set just so to keep you coming back. 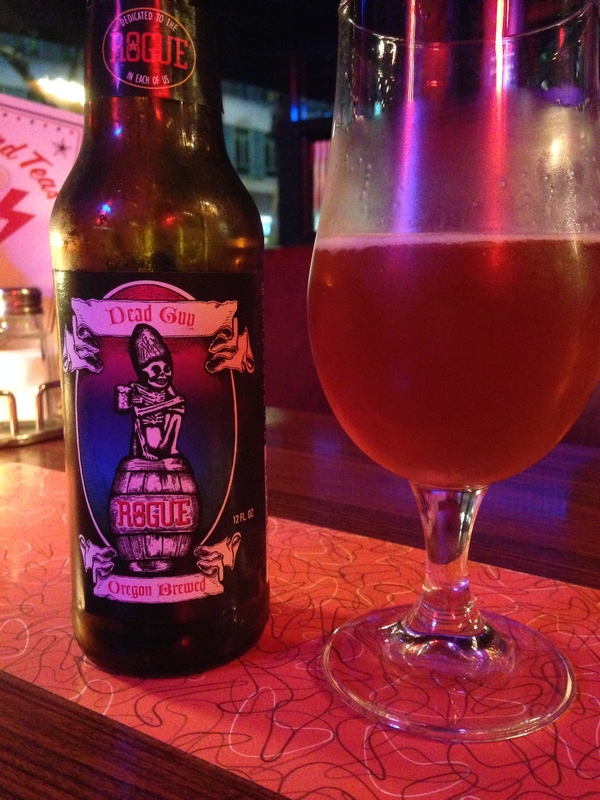 But if you do fancy a little more, then you must seek out their Green Devil IPA. Also brewed with only Citra, this is the original Citra’s bigger brother! Brewed locally to me in Dawlish, Devon, this beer has had a troublesome life. It went about upsetting the locals as apparently it was too far from the norm; And I thought Devon was full of Londoners? But this didn’t stop Isca and brewing of this beer has continued, like Brunel’s GWR, at full steam. 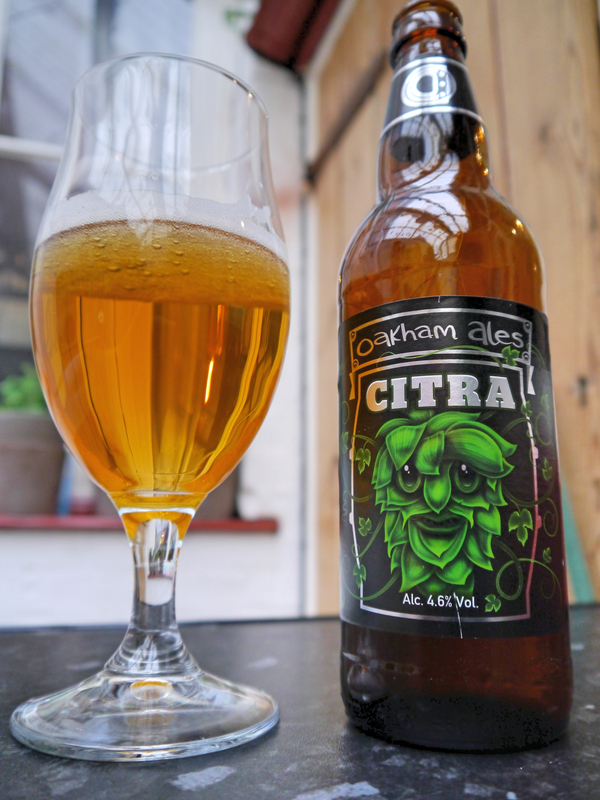 After Isca Ales had sampled Oakhams offering, they decided that Citra was the hop for them. Brewed using Maris Otter malt, wheat and Nottingham ale yeast, it ended up at a truly breakfastable 3.8%. This is one of the lightest Citra beers I have come across and certainly the lightest here. The aroma is delicate, as you’d expect, but it holds itself well and the spring freshness coupled to pithy passion fruit is subtle but inviting. On the tongue it’s gently malted and the fruits really get to work leaving quite a dry finish along with a mild bitterness. This is a pale brewed to 4.5% where bitterness and carbonation have been kept deliberately low to allow the full fruitiness of the hop to shine through. The aim of this beer was to make it taste as close as possible to the smell of sticking your head in a bag of Citra hops. Having never done that myself I can’t vouch for it’s success, but as it’s brewed using mainly pale malts, with a little touch of Munich, and an American style yeast strain, which adds little to the flavour and offers a very complete fermentation, the hop is allowed to shine without being hampered by the other ingredients. There are no bittering hops used at all, with a small amount being added 30 minutes from end of boil, followed by a large amount at the end of the boil and another large amount being used for dry hopping. This makes for a proper English style session beer, albeit with a strong American influence. And in the words of the brewer, when you’ve finished, you want another. And I’m afraid I’m inclined to agree with that statement! The tasting of this beer is fairly similar to the Isca offering but the aroma is fuller and there is more of it. There is a satisfying tropical flavour with the slightest hint of nettles. It’s also quite pithy too. 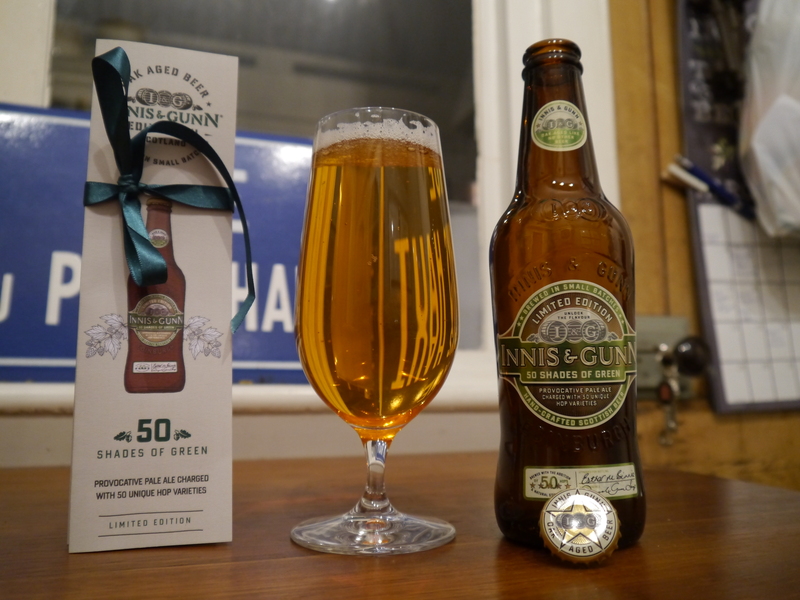 The beer has quite a light body but it’s far from being thin, and the fruitiness of the hop is presented cleanly with the malts staying well back. If you think Citra is the only hop Great Heck have used for a one hop wonder, then you’d be wrong; they usually brew one to try out a new hop variety and will continue to do so each time a new hop is unveiled, just to see what it can bring to the party. And in the cases of Citra, Simcoe and Columbus the results have been so good they were brewed again! But just brewing the same beer over and over isn’t one of Great Hecks rules; each time a beer is brewed again it’s tweaked to ensure there is continuous improvement. 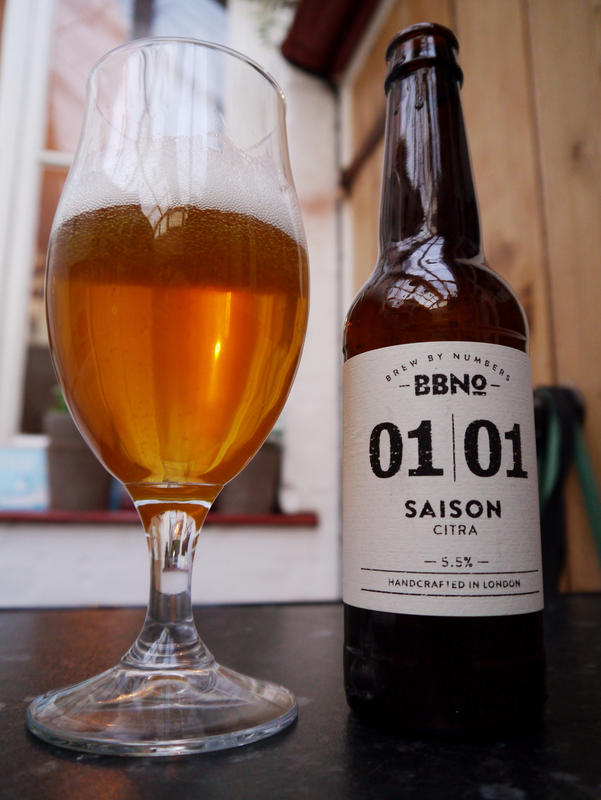 Brew By Numbers, Saison Citra 01|01. A Citra Saison? Interesting I hear you say. Well, you’d be right. This is Brew By Numbers own, modern interpretation of Belgian farmhouse ale which uses the Citra hop in a classic Saison recipe. Both Dave & Tom, being big fans of the Saison style, explored its versatility through experimentation, and discovered it was a great blank canvas that they could enhance by using different hops, fruit, spices, tea and many more ingredients that you may not necessarily associate with beer. And this, their first take on a Saison has been brewed to show exactly what they can achieve with this style. The Pilsner malt, low colour Maris Otter, along with wheat malt and flaked wheat, make the base of this beer conform to the style and gives the beer a slightly hazy in glass presence with a nice pillowy head; which is characteristic of malted and unmalted grains. The flavour profile of a French saison yeast is preferred, as it yields a nice dry and peppery finish, without too much banana. The spice and funk present in the yeast also play off well with the passionfruit and mango supplied by Citra, which itself can be quite funky; a trait that works well with the farmhouse style and unusually so for a US hop. In this case, hop pellets were the preferred tool as opposed to leaves, due to the greater flavour given up. On top of this, coriander and crushed black pepper were added to enhance the characteristics of the fruity yeast. The strength has been determined mainly by tradition; you have to remember the origin of the Saison was to provide refreshment for farm workers when the water was less than safe. It also aims to be refreshing and light but without the heavy alcoholic content found in some other beers of this style. The aroma of this beer is very different to all the rest here; it’s zesty, yeasty and a little spicy too. The appearance is exactly as previously described, although mine was a little less hazy than I was expecting. There is the mildest hint of banana on tasting but it’s so small it doesn’t interfere with the spice and passion fruit contained within. It’s also very yeasty and bready, which makes it feel nice and wholesome. It’s so full of flavour, each mouthful varies slightly as the beer opens up but that just adds to the satisfaction the beer brings. The finish is quite dry and really does lend itself to a sequel. When it comes to single hop beers, Brew By Numbers believe they can be used as good educational tools for brewers and drinkers alike. As quite often, the more ingredient laden the beer is, the more muddled the flavours can become and nuances that can be discovered in a single hop beer can sometimes be lost. This Saison isn’t their only single hop beer either, Mosaic has been used in an IPA, session IPA, Tripel and also a Saison. The scarce Nelson Sauvin is another hop that they love, and they’re also very interested in the new Noble varieties such as Hallertau Blanc. Where do you start with The Kernel? With such a concise catalogue of beer it’s hard to not find the beer you want. And their Citra IPA isn’t the only beer they’ve produced using only this hop; they also offer a table beer at 3%, a pale at 5% and this the IPA at 7%. different intensities at the different abvs. 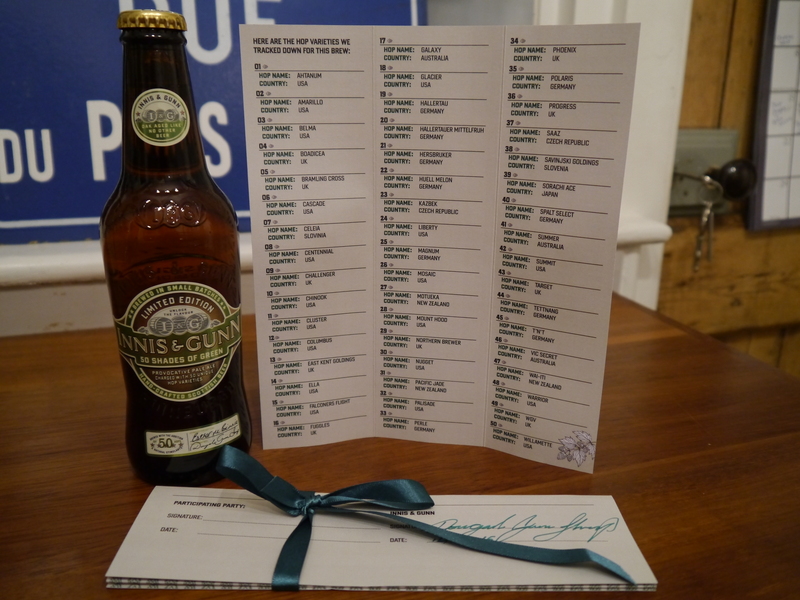 So when it comes to selecting a beer, you are offered a real choice to suit your mood, food or just whatever your preference may be! The Kernel brew a lot of beers in this form as they often prefer the singular expression of, and essence, that you only get in single hopped beers. Pretty much every conceivable hop has been used too, so if you want an IPA or a pale with a specific hop, you’ll get it here. All of their single hop beers have been brewed with just one goal; to smell and taste exactly like the hop by letting the hop express itself, and in this case, Citra. Brewed with a low colour Maris Otter to provide a firm body but not interfere with the hops, a Cal Ale yeast, which is fairly neutral, is also used but takes a back seat to allow the hop to shine through. The same malt and yeast is used in all of their beers for the same reasons and also to get consistent results where the hops takes the lead. And when I asked the brewery what they thought made this beer work, their answer was simply, Citra. 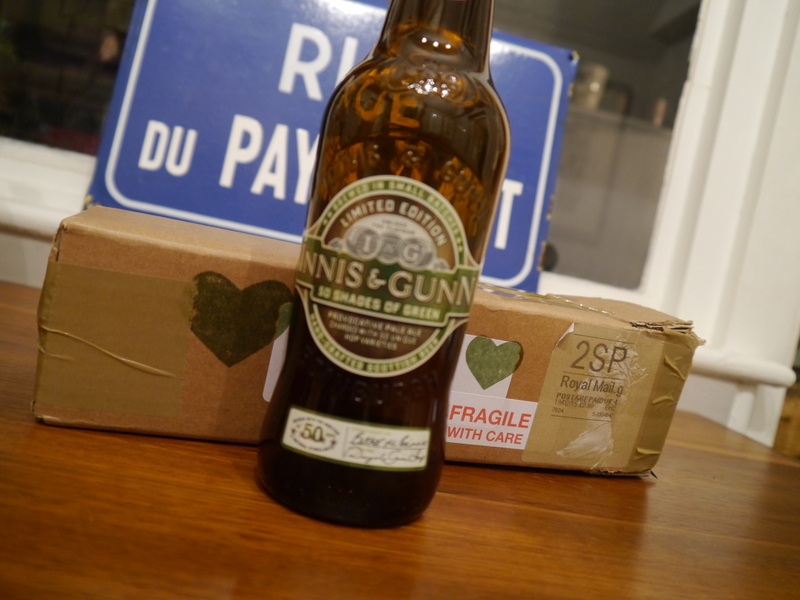 And I just happened to have a nice fresh beer which was bottled just one month before my tasting. Darker in colour than the previous pales, the massive passion fruit aroma just leaps out of the glass and plants itself right in the depths of your nostrils. This is fantastic, and tasting is full and luscious . It’s quite sweet, but not sticky, with the fruits there in abundance and a slight bready maltyness is evident too. The finish leaves you licking your teeth to try and get every last drop! The higher abv certainly gives it a lot more presence and this is definitely one to savour, possibly. 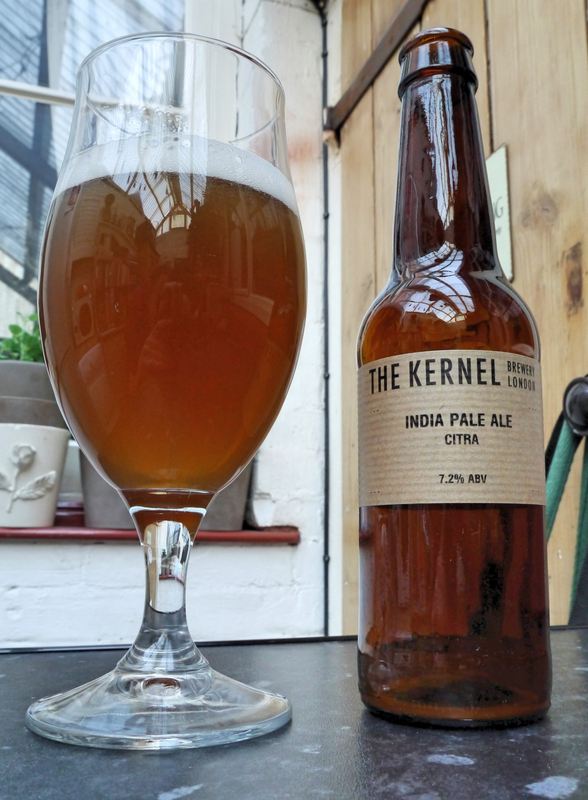 But if this wasn’t enough, and you were looking for something a little more, lets say intense, then the Kernel have in the past brewed a Double Citra at around 9%. 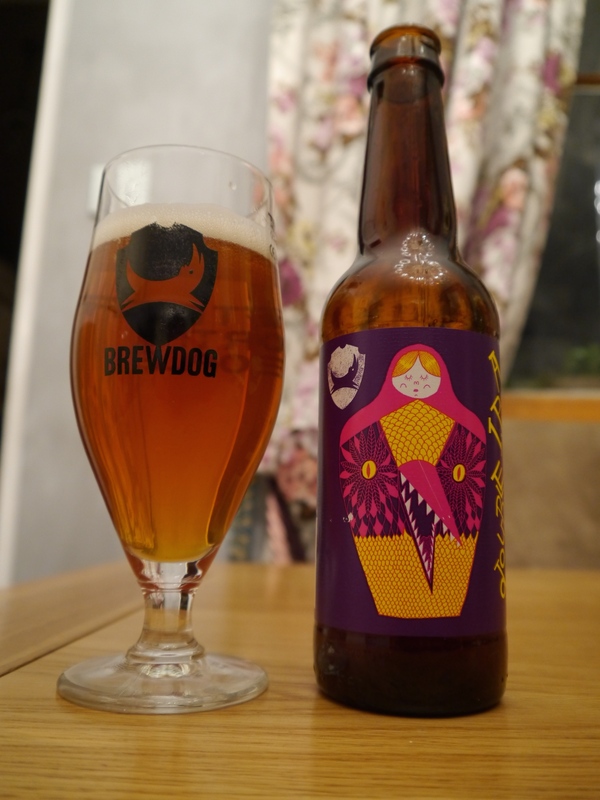 Now I am yet to sample this, and I do know there is quite a demand for this beer to be brewed again, so it’s over to the Kernel to fill the void as it were…. Now if the earlier mention of HBC 394 didn’t get your adenoids twitching, then the beer spotters amongst you will notice that this is their 19th brew, and another unique one at that. 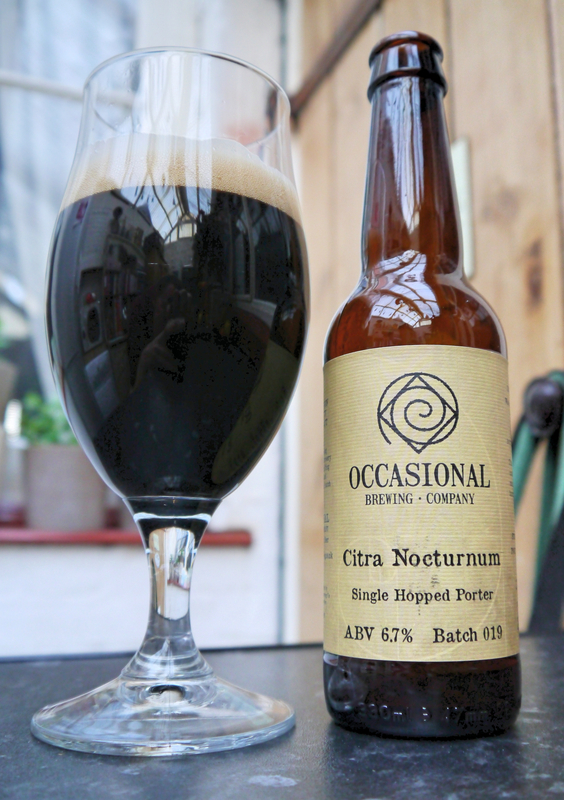 Citra Nocturnum is a beer designed to showcase the awesomeness of the hop Citra, but in a bit of a different way, porter style rather than pale like many breweries have already done. The malt base of the beer itself is an adaptation of a Barclay Perkins porter recipe, with the addition of Citra for bittering, flavour and aroma, followed by a double dry hopping. And in using Maris Otter, brown, chocolate, Munich, black and crystal malts, along with US-05 yeast, the big hop flavours are backed up with a smooth roastiness after their initial impact. I was lucky enough to obtain a few bottles of this on the same day that they arrived in the shop, again, making this one fresh beer. And it’s freshness is so visible on just the slightest crack of the top. The smell just oozes out of this on pouring. It’s quite viscous, which you’d expect for a good porter, but that intense aroma is baffling. With your eyes closed it’s a fresh bowl of fruit in a tobacconist come coffee shop; The passion fruit and tobacco aroma coupled with coffee is intriguing to say the least. Tasting on the other hand, is just staggering. The punchiness from the hop is awesome and the deep malty flavours really add to the complexity of this beer. Never before have I sampled a porter that tastes this fresh and inviting. Brewed to 6.7%, it has a bit more kick, but it’s not something you couldn’t still enjoy a few of. And in case you were wondering where the name came from, Nocturnum is the Latin adjective of Noturnus. Meaning ‘of, or belonging to the night’. Which in the mind of the brewers, seemed pretty appropriate for a dark beer that has a little something about it, and rightly so. This has been good fun, trying all these beers and having a little Citra off. Although, as good as they are, I do often wonder why there are quite so many pales brewed. The Porter and the Saison show that by using a little lateral thinking, Citra can be used to create a beer that truly does stand out from the rest. 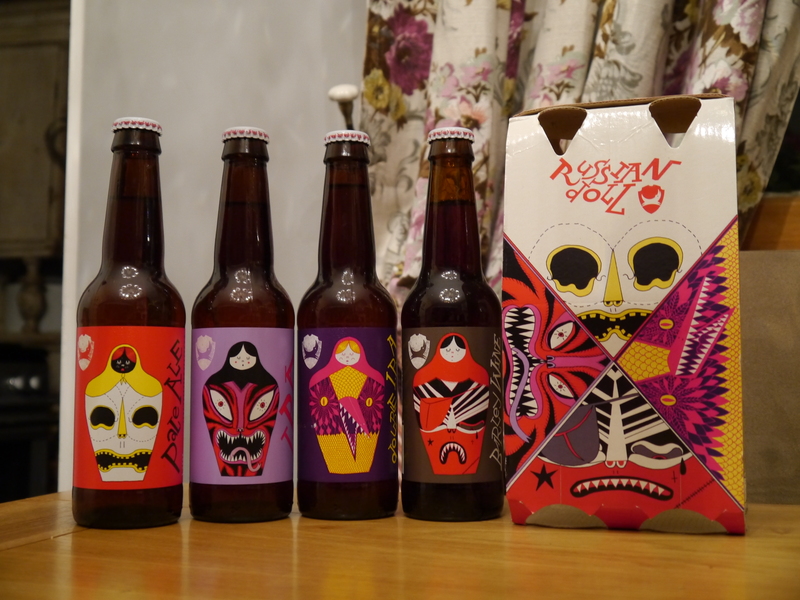 Don’t get me wrong, I’d happily drink all of these beers again, but it is nice to see something a little different. But then equally, the high number of pales is largely irrelevant as they are all different, and they do have their own place. Let me put it this way, if these beers were the results of a brewing contest where the rules were to use only the Citra hop and then have complete freedom over the rest of the ingredients; then you can now see that each brewer has interpreted the instructions in their own way and we have ended up with six unique beers. Even though in reality one may be emulating another, they are all still different. 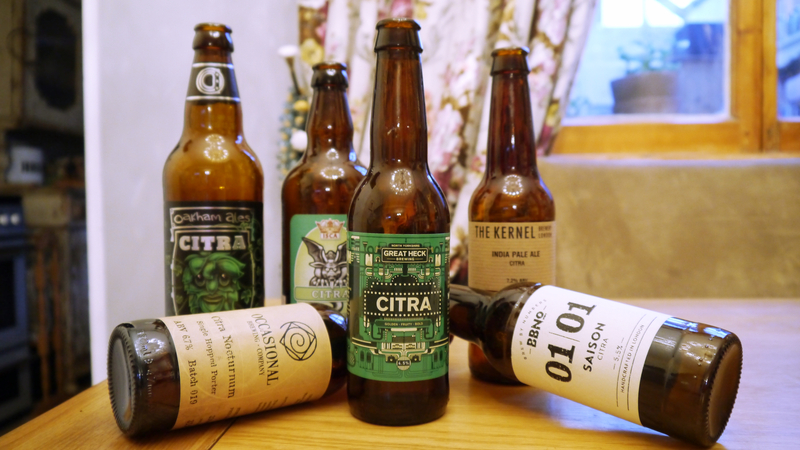 So to finish, I must say a massive thank you to all the breweries for their Citra beers! And thank you for providing the information that without which this post would not have been possible. I’m not one to cheat, but when your wife goes to Berlin for the weekend and you have some ladies saved for an evening together…… Well, you just have to oblige and take advantage of the situation. 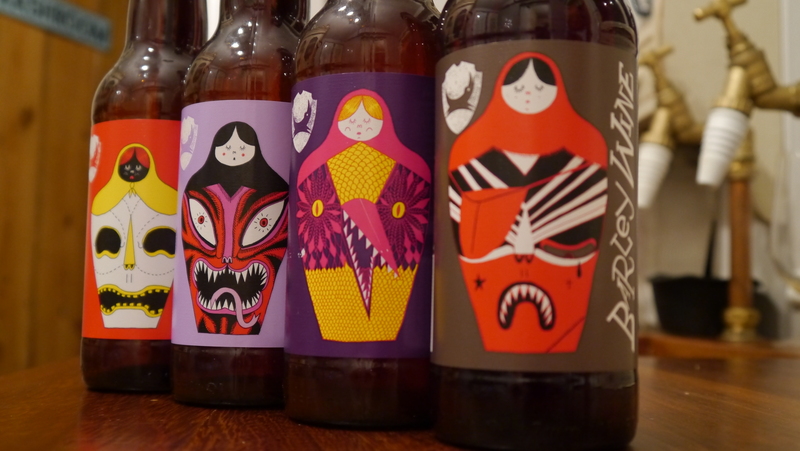 (Now you must realise that I’m not actually going to cheat and the ladies in question are the four Brewdog Russian Dolls). So, phone off, lights dimmed and John Legend setting the mood, I collect the Dolls from their hiding place. I’ve never been great at judging a book by it’s cover and I would always get sucked in by some pretty pictures to then realise what I’d actually bought was a pretty poor and expensive leaflet. But, on this occasion, I was anything but let down. The artwork just jumps out and pulls you in, and I mean it drags you in. If you’ve read about the Dolls but haven’t tried them by now, then you are really craving them, and the artwork just adds to the fascination. Miles away from being just a beer label on a generic four pack, it doesn’t need an aged He-Man wannabe prancing around a studio glacier to sell it, this is art. 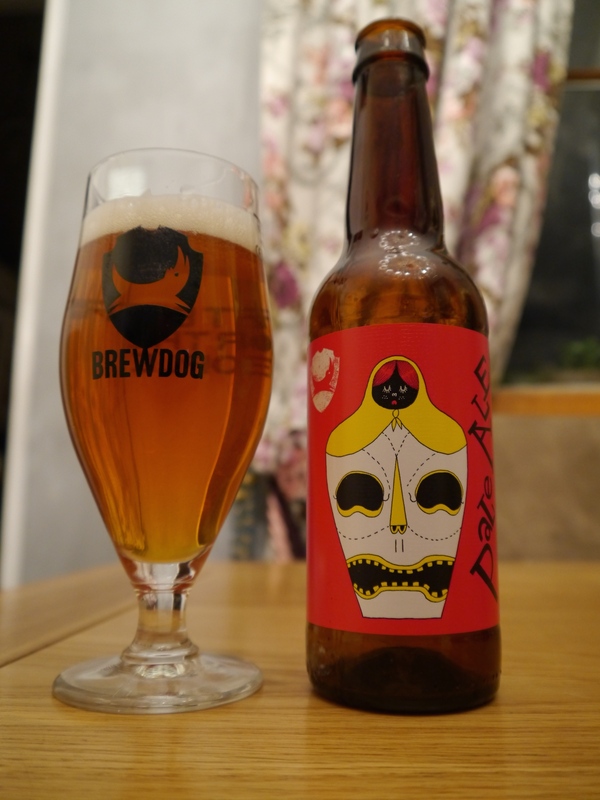 What Brewdog have done is made everybody who loves their beer become completely infatuated by it, and the artwork is almost collectable. I mean you’re not just going to see these ladies put out for recycling now are you? To tell you the truth, I didn’t even want to open these. They have been in my beer box since Christmas and I wanted to hoard them and guard them forever. Every time I went to grab a beer, I’d check to make sure they were still there. No one else would drink them, but I saw myself as their guardian, protector almost. But as I’ve said, my wife’s in Berlin and I have a date…. So just what are the Dolls. Are they quads? Two pairs of twins? Or just sisters? Well, although they share the same DNA, they are anything but identical. The same hops and malts may be used in each beer, but they’re blended in different quantities to give a different, and progressively higher ABV for each iteration. 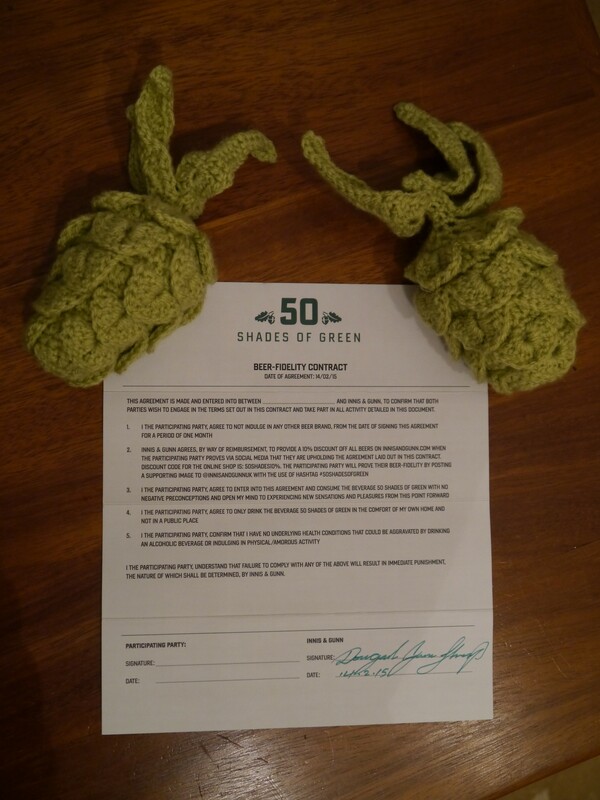 So, lets get ourselves acquainted shall we…. The Pale. She’s not necessarily one to play it safe, just measured, balanced and in control. You could hang out all day and she wouldn’t put a foot wrong or say anything out of place. But she knows just how to keep you from straying. Pours with a light golden colour, nice and clear. Has a good and fine head that quickly diminishes. The aroma is delicate and citrusy that’s ever so lightly peppered. You really have to chuck your nose in to get at it, but it’s good. It opens up nicely on tasting, being really fresh, crisp and bitter. This is a good classic pale. It’s lush and velvety in the mouth, with quite a similar finish to Dead Pony, only slightly softer on flavour. The IPA. She’s definitely a step up. Got a cheeky side. Like a drunk student moving for-sale signs, she can have fun but she knows when to call it a night. Just a whisker darker than the pale, with a slight cloudiness caused by suspended bubbles. More intense aroma, more proud, and it’s all about the citrus fruits. This really reminds me of candied orange and lemon segments. The bitterness has increased and tasting is of creamy orangeyness. It’s far from being pure OJ, but it’s there alright. And that orange flavour lingers right in the back of your throat too. The Double IPA. Now things are starting to get interesting. She’s bitter, a bit twisted. Constantly in your face and ensures that you take the rap whilst she carries on. Again we’re going darker in colour, similar aroma to the IPA, just a smidge more of it and hunting isn’t necessary; we’re making real progress now. The orange is tangier and now slightly marred by the creeping malt presence. The malts are starting to give off a mild honey note which makes this sweet on the tongue. Still very bitter but the sweetness balances it nicely. There’s also a good chunk of caramel coming through. The increase in viscosity since the Pale and IPA is noticeable but it’s far from being chewy; just a good round texture. This is an excellent Double IPA, which offers a slightly different take to what I’m familiar with. But go careful though, we’ve left the session drinks far behind now…. The Barley Wine. Well, imagine Shirley Manson fed purely on a diet of Buckfast; Indefatigable, unashamedly full on and certainly not one to bring home to meet your parents. Much much darker now, with the presentation being a deep reddish brown. Pours with the same fine head as all the previous Dolls, just slightly slower, and with nothing in suspension, due to the further increase in viscosity. The fruitiness of the aroma has dulled and very is close to becoming overpowered by the extreme maltiness. 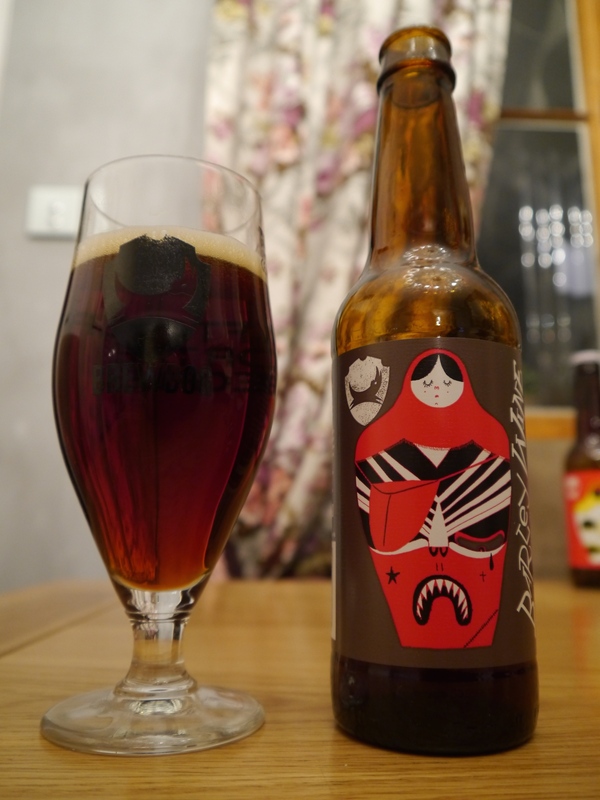 Exceedingly sweet, with an intense hit of malty, toffee-esque, jammy alcohol coming through. It almost has a whiskeyness creeping in around it’s depths and because of this, you’d best take your time…..
Having these beers just sat there waiting was hard. They were like the actress with seductive glasses, you know the one, who when she removes them becomes the star? Yeah. Except in this instance, she was keeping them on and withholding her secret, a secret that I was so desperate to reveal. And now, with the glasses removed, I can assure you it was worth the wait. So this is christmas and what have we here; fortunately for you, nothing tainted by Bob Geldof or Simon Cowell. I’m sure you’d love me to bang on about how amazing Christmas is but I’m not, it was all about New Year for me! So once we’d got all that fuzzy Christmas gumpf out the way we had a few days planned in Cardiff with friends over New Year. I had one request, and that was to visit the Brewdog bar. 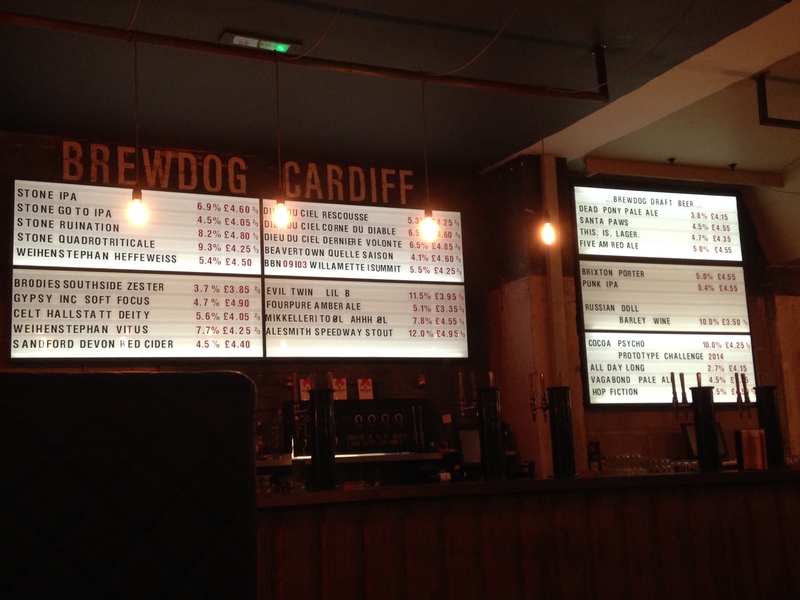 We’d been wandering round Cardiff on New Years Day and I was hungry and in dire need of some refreshment. After a quick visit to the Gourmet Burger Kitchen we made our way to the bar. A little tucked away but still within an easy walk of the station and the castle. We found a seat, a nice booth, and fathomed what we’d take. I have to say now, the staff here are amazing. It had been raining and the bar tender offered me a tissue to wipe my glasses; this is something that has never been offered to me before, not even in any restaurant, ever. Fact. 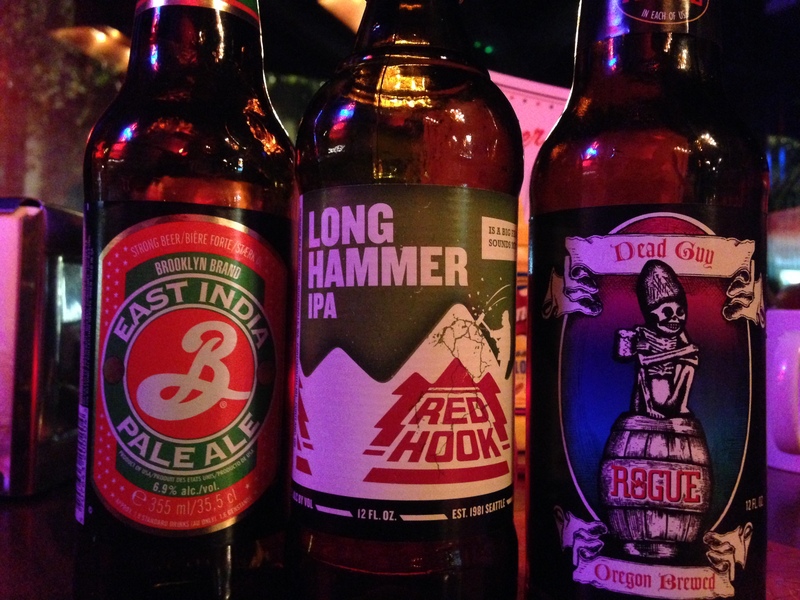 Now we all know Punk IPA is great, but you can’t just opt for the safe bet. Although, I’d never sampled the Punk on draft so I was intrigued. I was offered a taste and, oh my, I was simply blown away. You may think you know this beer, but I can tell you now, if you’ve not had this on draft you do not know it and you are clueless about it’s full potential. The aroma is sublime, the hops just burst out and the snifter it’s offered in can barely contain it. The mouth feel you receive truly is something else, you get that proper draft pulled effect which a bottle can never replicate. Punk, on draft, takes it to another level. At this point I was quite happy to settle for a pint, but the tender had other ideas. He asked what type of beers I liked and offered samples of his recommendations. IPA I said, he duly responded and presented another snifter containing just enough Stone IPA. This is a beer that I’ve never tried before and again I was put back in my seat, and that’s quite a feat considering I was stood up! The pine and fruit aromas emitted by the Stone are sublime; why on earth doesn’t Olbas oil smell this good? I learnt a little trick for beer tasting tonight, which was to swirl the glass, take a good long sniff through the nose, place it in your mouth, let it swim around and then swallow. Now the most important part after swallowing is to keep the mouth closed and exhale thorough the nose. This just lights up the back of your throat and gives the beer a second coming. I’d never done this before but I recommend you try. The tasting continued and next up was Ruination by Stone; simply another mind-blowingly fantastic US style India Pale. I opted for a half, took my seat and tried so hard to savour the hoppy bitterness. I was dying to get back to the bar and let the tasting session continue, but no, I remained seated and politely supped my beer. Ruination is a superb name for a beer, it’s like a slap in the face to all the piss poor US and UK breweries out there. On nearing the end of this beer, I peered over to the bar and tried, and struggled to decide what could and should follow. 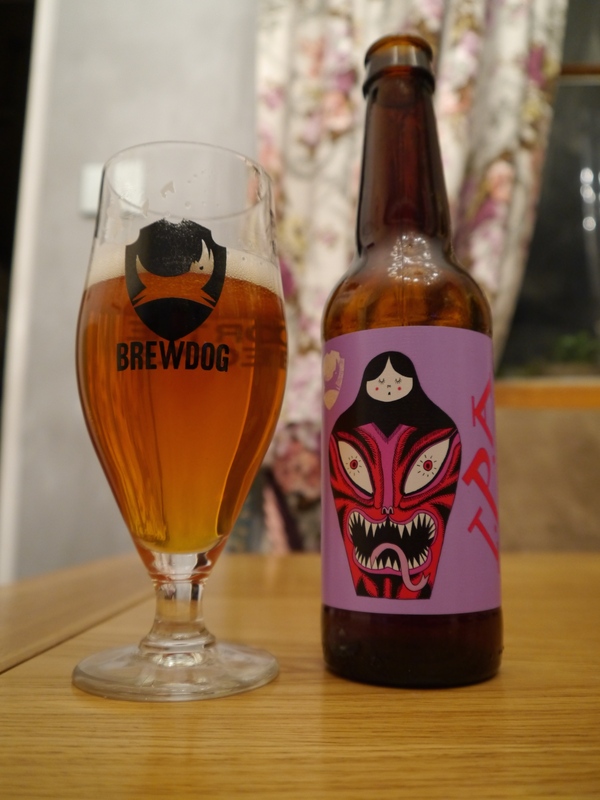 The tasting session that followed was immense, with snifters of Russian Doll barley wine, Cocoa Psycho, Brixton Porter, Santa Paws, Brodies Southside Zester; this is very interesting, kind of like a lime cordial but in beer form. And the list goes on, Stone Go To IPA, Dieu Du Ciel Corne Du Diable and Alesmiths Speedway Stout; the list continued on and to be honest I began to lose track at this point. We ended up with around fifteen tasters and I can only thank the bar staff for allowing it. The experience of tonight’s visit is one I’ll never forget and Brewdog have lived up to their name. Visiting one of their bars is an unpressured experience and their knowledgeable staff really make you feel welcome. 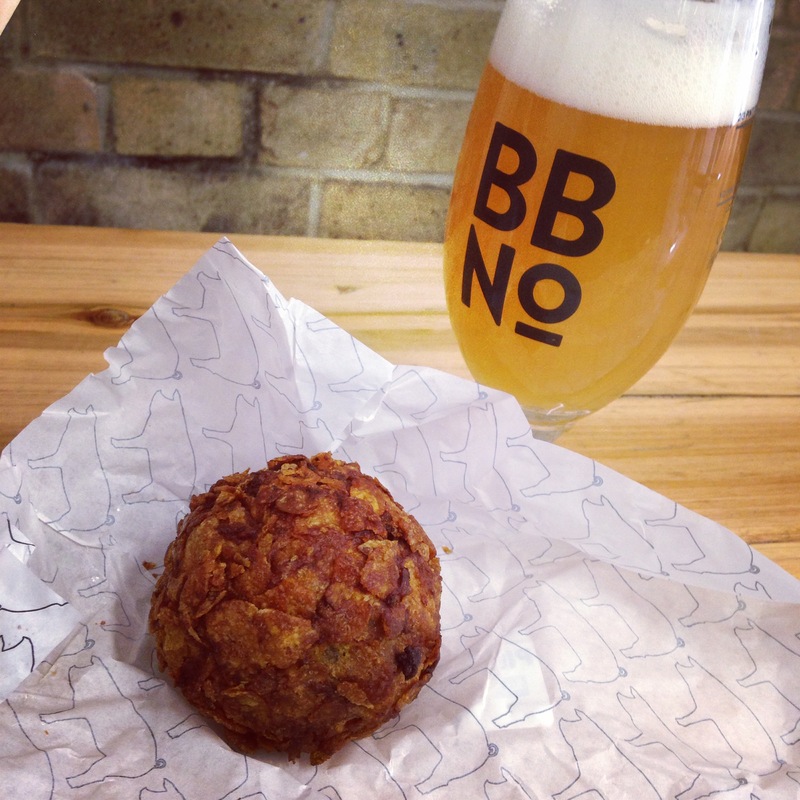 If you’re not sure about beer or are too afraid to ask, then your local Brewdog bar is the place to go. Salon International. What? Where’s my beer!!!!! You assured me I could have a beer! Now this is going back a bit, but after an interesting day at Salon International with the wife, (This was somewhere where I forgot my fishing rod for all the trouts that were there. But on the plus side, there was a lot of leather. Now I’m quite partial to a bit of leather, but I’ll let your imagination do the rest. After that bit of excitement, I was wandering around feeling somewhat inadequate. I need a beard, a proper beard. All I can muster is some sort of cress type formation clinging to my cheeks) we made our way back into The Smoke and headed for THE best place to eat in Covent Garden. The Goodlife Diner, on the corner of two roads, I forget both names, kind of irrelevant, you’ll find it if you want. Now the food here is amazing, proper comfort food where you can just settle down and enjoy some real dirty, gooey, proper chill out and relax, cheese dripping burgers. 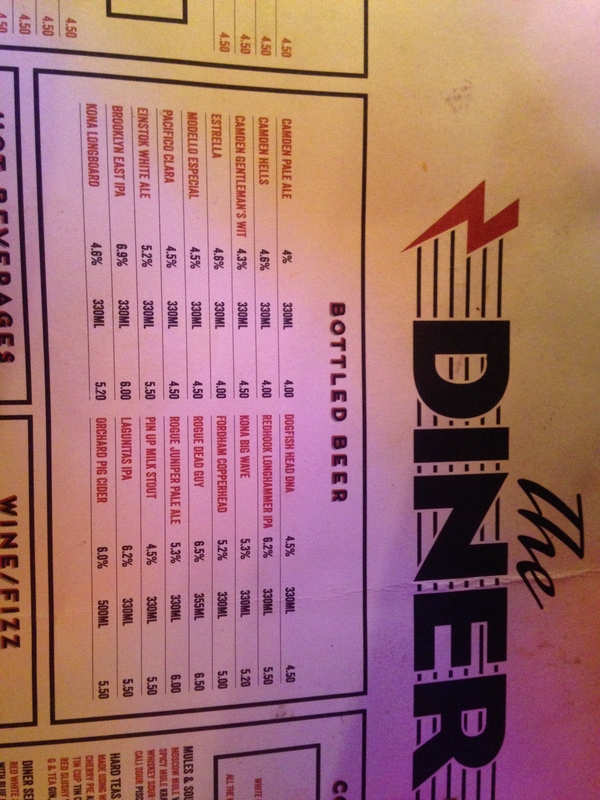 Their beer menu is almost, no, more intriguing than the food. With a cracking choice of US IPA’s amongst others, I know I’m in for a good night. The wife, being the snob she is, commenced with a whisky sour, but I, on the other hand had to set things in motion with a nice US pale. Now you know you’re going to be in for a treat when the tulip glass you requested arrives on the table juxtaposed with the beer. 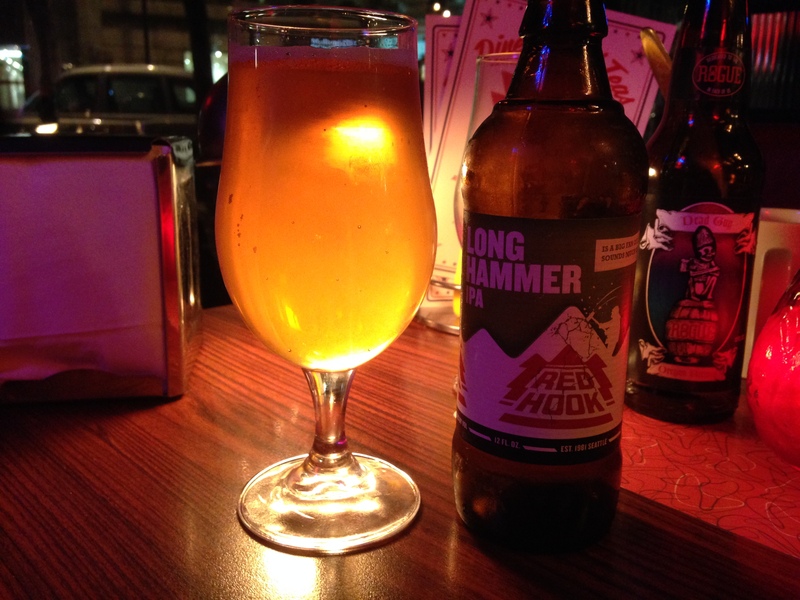 First up was the Longhammer IPA, quite different to what I was expecting. Slightly lageresque to smell, almost malty. But this shouldn’t be viewed as a negative so don’t be put off. The malty smell fades quickly on tasting and you are nourished by a really fruity, lychees taste that combines with the mildest hint of liquorice. Quite odd but very satisfying at the same time, although I may have had something on my palette that was interfering here. This was followed by the Brooklyn East IPA, now I’ve sampled this in bottle form from the supermarket, but somehow sat here in The Diner, this has transformed into something quite special. It’s smooth fruity notes turn out to be quite bitter but it always keeps you wanting more. The minuscule bottle it’s presented in should really be far, far bigger. You really need to sit, eat, and hope this beer never ends. If the burgers and fries, covered with gooey cheese haven’t filled you up by now, finish them all off with the Brooklyn East IPA. And the observant amongst you will have noticed the Rogue Dead Guy and are probably asking why no write up? Well, I can’t tell you everything can I? Go and find out for yourself! And just when I thought the fun was over, we arrived at Paddington to catch the train home and, right in front of me on the station concourse was The Beer House! Absolute winner, quick check of the watch, yes time for another. 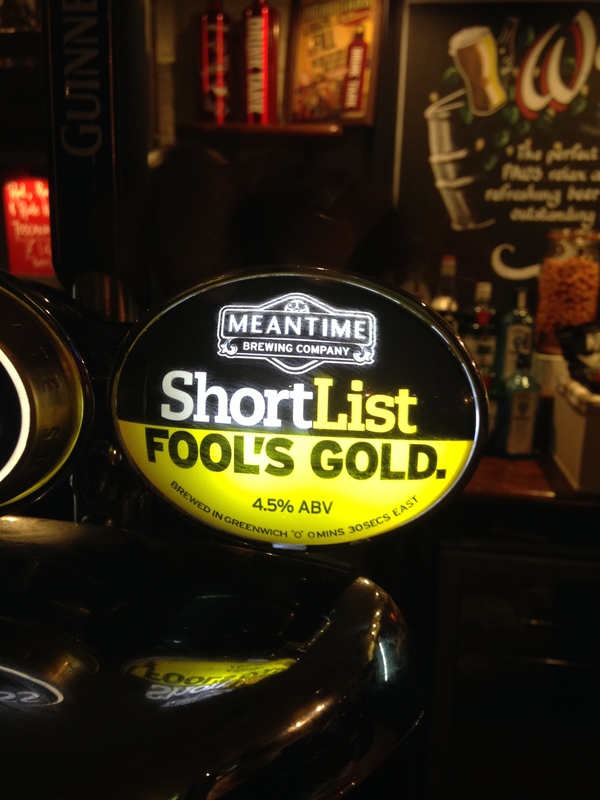 I couldn’t believe my luck when I saw on the bar Brewdog 5AM Saint and Meantime’s Fools Gold. Now, I love The Saint but Fools Gold was a new one to me, so the order was placed. This was presented with a nice straw colour and light maltish smell, I couldn’t wait to dive in and taste the pyrites. Sat here, in the middle of such a busy city, and in Paddington Station, this beer just completed the day. So refreshingly light but packed full of crisp, hoppy flavour. This has really finished the day off nicely. Now just two and a half hours on the train home.